Thinking about taking a vacation in the coming months while expecting? Individually, being pregnant and heading out for the holidays are both joyous things – but finding a balance between the two can be hard. It’s important to be able to relax during your pregnancy, for both you and your baby’s sake. It’s for that reason we’ve decided to compile a list of five of the best ways to stay stress-free when traveling while pregnant. This list will help any future moms maintain a healthy level of relaxation throughout their journey. Just as it benefits people during daily life, yoga can have a positive impact on pregnant travelers. With studies finding that several techniques have been proven to boost relaxation levels, it’s worth trying out a few moves when you get a spare minute. What’s more is that yoga offers a range of additional benefits for soon-to-be moms including improved sleep, decreased lower back pain, reduced nausea, decreased headaches and even a smaller chance of preterm labor! Let yoga serves as both a channel of relaxation and a means of staying healthy. Ready to get started? Early in your pregnancy, you should be able to do yoga safely as long as you listen to your body and stop if you feel too tired. But, as your belly grows some poses may be a challenge or even be unsafe. Here are some safe yoga poses to try when pregnant. Try these poses from Yoga Journal to keep your abdominal muscles strong and improve your posture! Here are a variety of poses to try out, see what feels best! There is a range of relaxing poses in this post as well. The best part of yoga while traveling? You really don’t need any equipment. Just use a carpeted area or throw down a blanket and you’re ready to go! Before beginning any exercise routine, even yoga poses, check with your doctor to see if it’s right for you. Holidays of this nature will provide all the fun and excitement you’ll crave, without pushing your body to extreme lengths. In truth, you don’t even need to restrict yourself to a certain “type” of a break. As long as you’re sensible with what you do when you’re actually on your adventures, you should find relaxing is always a possibility. As such, days out where you’re physically exerting yourself are probably best to skip. Relax on the beach, tour museums, walk through quaint island towns, head to the spa, try delicious safely prepared local cuisines…these are among the activities you’ll probably most enjoy. If you take steps to plan ahead before your trip, you’ll find things are considerably more comfortable when you’re out there. Not having to worry about what activities you’ll be doing will relieve a lot of the stress you’re naturally bound to feel while traveling in a pregnant state. Of course, you won’t be able to stick to your routine throughout the trip religiously. Things do pop up which change what you had in mind. That said, if you have a rough structure in place, these would hopefully just be “fun changes,” rather than stressful ones. Not sure what tours are best? You can always speak with a travel planner experienced in the destination of choice, or head to a local tour company when you get there. They’ll be prepared to offer you many safe and relaxing options appropriate for pregnant travelers. A note on planning ahead: Choose the timing of your trip with care! Most doctors recommend the second trimester as the best time to do long distance travel. You’re beyond the stage of morning sickness, and it’s unlikely that you’ll unexpectedly go into labor yet. However, it’s always best to note the nearest hospital and travel with your prenatal records in hand, just in case. Of course, check with your own doctor first. It’s always wise to know what to expect before any holiday. Doing your background reading and discovering what lies in store for you can go a long way to helping you feel relaxed and at ease. Again, the last thing you’ll want is for something to spring up which leaves you panicking because you weren’t expecting it. Learn as much as you can about your holiday destination before heading there. Check the weather, look at reviews and learn about local cuisine and customs if you’re headed abroad. Talk to your doctor about any concerns you have. They’ll be able to give you sound advice about what foods to avoid and anything else you should be aware of while traveling pregnant. The peace of mind you’ll receive is invaluable. Travel can mean a lot of time on your feet, and when you’re pregnant, that can be extra tiresome. This means you should prepare ahead of time by purchasing comfortable walking shoes (think flats!) and maternity wear. After you’ve researched your destination, you should have a good idea as to what sort of weather to expect. When in doubt, pack comfortable clothing made from soft fabrics that you can layer depending on how warm or cold it is. The great news is that today there are many clothing companies that offer attractive pregnancy travel gear, including yoga apparel that’s extra comfortable. A jersey dress, a few scarves, and some comfortable maternity pants should definitely be on your packing list. With these tips, you’ll be prepared to get the most out of your pre-baby trip. Make sure to keep them in mind when you next head of on your travels with a bun in the oven. They will prove to be a huge help. 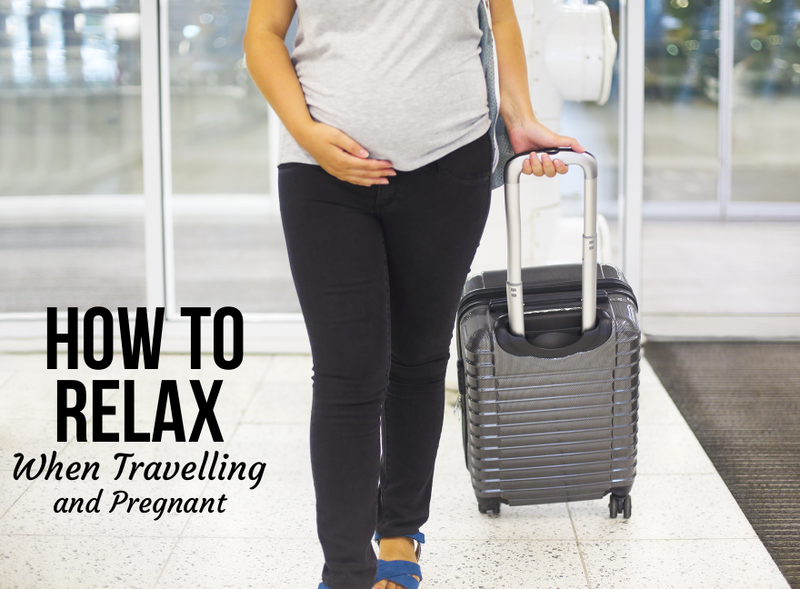 Do you have a favorite tip for staying relaxed while traveling and pregnant? We’d love to hear from you. Tell us about your experiences in the comments section below.